No community is immune to emergencies or disasters. 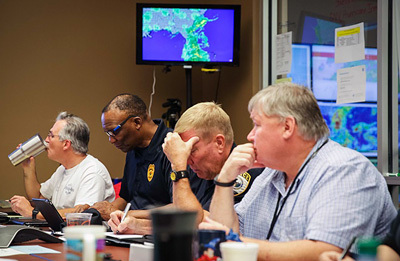 In every state, county, and municipality—across all levels of government and branches of public service—there are dedicated men and women working to prepare for and respond to incidents to keep communities safe and aid in recovery. This includes public works officials who work alongside law enforcement, fire, and emergency medical service (EMS) personnel responding to emergency events that impact residents. Oftentimes, public works personnel are the longest first responders on scene, helping to clear roads, restore power and electricity, and rebuild communities. With technology increasingly taking on a bigger role in disaster prevention and recovery efforts, public works personnel require strong broadband connections to access mobile devices and applications more than ever before. With the recent launch of FirstNet, the Nation’s wireless broadband network dedicated to public safety use, public works officials now have access to reliable, secure, and robust emergency communications to help them better coordinate with public safety entities. FirstNet is designed to meet public safety’s demanding needs, including during times of heavy network use, inclement weather conditions, or large multi-agency response efforts, which often occur during natural disasters. Now that FirstNet is available, it can play a vital role in sustaining enhanced communications for public works agencies in their efforts to help prepare for, respond to, and recover from disasters. To assist in a unified response to an emergency, it is critical that our public works agencies transfer data between field operations and staff in the office. It is also vital that we share our infrastructure mapping with police and fire officials. For example, if a chemical spill gets into the stormwater system, it may be important for a public works agency to share the system design and other infrastructure data with public safety agencies to ensure the materials are intercepted before they spill out into our rivers and creeks. Today, FirstNet makes this possible. Built to support the entire public safety community, FirstNet offers public works agencies quality of service and priority, as well as access to spectrum dedicated to public safety (known as Band 14) to help them communicate and coordinate with public safety partners. This ensures that public works can count on a reliable connection during emergency operations. During incidents, public works agencies can also be provided preemptive capabilities through their local partners in law enforcement, fire, or EMS. FirstNet is also focused on bringing the latest devices and apps to public safety. From ruggedized smartphones and tablets to the latest off-the-shelf tech, FirstNet is providing subscribers with access to the latest gear and apps. For example, FirstNet users are taking advantage of over-the-top apps like push-to-talk to collaborate; share real-time data like files, texts, and images; and streamline communications. A dedicated broadband network for public safety has been a long time coming, and it is great to see the progress FirstNet has made since the network launched last year. FirstNet is already supporting public safety agencies in day-to-day and emergency operations, including wildfires, floods, tornadoes, search and rescue missions, and large-scale community events. As the American Public Works Association representative to the FirstNet Public Safety Advisory Committee, I’ll continue to ensure the voice of public works personnel is heard as the network is built out. I encourage any of my colleagues to reach out to FirstNet or myself with any questions. This is our network. With FirstNet, we’ll be better prepared with the connection we need to help our communities. To learn more about FirstNet, visit FirstNet.gov or connect with the First Responder Network Authority on Twitter or Facebook. For more information on FirstNet products and services, visit FirstNet.com.